We’re committed to a sustainable and regenerative future for the land, its residents and our community, and thriving ecosystems here at Bronhaul long into the future. We are trying to tread gently on the land and reduce our impact on the environment, managing the land in ways that build the soil, encourage biodiversity and regenerate both wild and cultivated spaces, working with nature. Our electricity comes from our own solar panels (when there’s enough sun!) and we are sourcing the rest from Good Energy, who guarantee that all of their electricity comes from local renewables. We heat all of the buildings at Bronhaul with our solid woodfuel biomass boiler, fed with a sustainable wood source from our woodland. 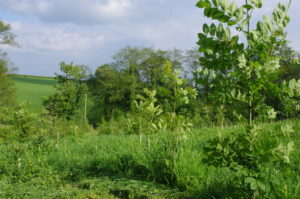 So far we’ve planted over 2000 trees, with plans to plant hundreds more every year to guarantee a regenerative wood source long into the future. We also work hard to minimise the waste we produce, create ways to reuse the waste we produce and to reuse waste materials from the local area. We also use only ecological cleaning products in the cottages and washing machines. 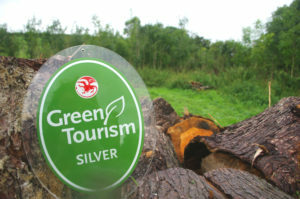 So you can rest easy that we are always working hard to reduce the impact of your holiday! 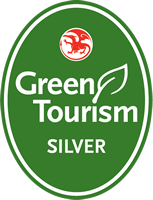 This year, we were rewarded with the Green Tourism Silver Award for our efforts towards sustainability, community, local food and reducing the environmental impact of our farmstays. But don’t worry, we’re not stopping yet, we’ve got our eye on the Gold Award! There’s still a long way to go, but if you want to know more about how we’re working towards sustainability and ecological farming, please don’t hesitate to ask, or find out more here.